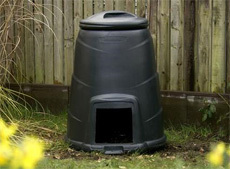 You can also help the environment at home by setting up your own compost bin. When waste is sent to landfill, air cannot get to the organic waste. Therefore as the waste breaks down it creates a harmful greenhouse gas, methane, which damages the Earth’s atmosphere. However, when this same waste is composted above ground at home, oxygen helps the waste to decompose aerobically which means hardly any methane is produced, which is good news for the planet. And what’s more, after nine to twelve months, you get a free fertiliser for your garden and plant pots to keep them looking beautiful. Your compost is a nutrient-rich food product for your garden and will help improve soil structure, maintain moisture levels, and keep your soil’s PH balance in check while helping to suppress plant disease. It will have everything your plants need including nitrogen, phosphorus and potassium and it will help buffer soils that are very acidic or alkaline. Compost improves your soil’s condition and your plants and flowers will love it! What can go into your Compost Bin?